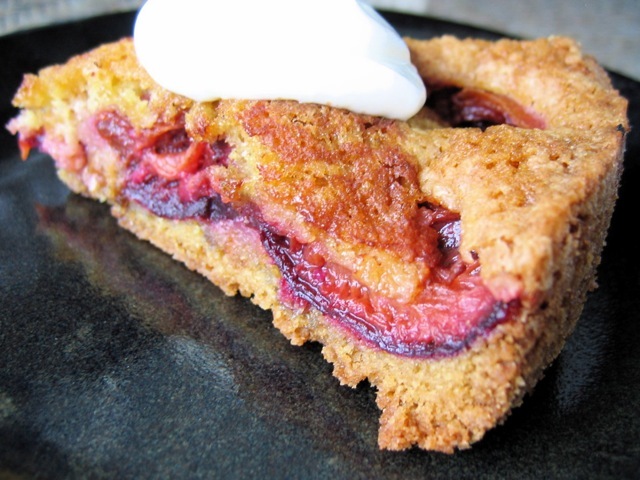 A richer, denser dessert than Italian Plum Cake, this recipe comes courtesy of a family friend. Preheat oven to 350 degrees. Butter and flour a 9-inch springform pan. Using an electric mixer, cream together the butter and 1 cup of the sugar. Add the flour, baking soda, salt, and eggs; blend well. Spread the batter over the bottom of the pan and arrange the plums, cut sides up, on top. Mix the remaining ¼ cup sugar with the cinnamon and sprinkle it over the plums. Sprinkle with the lemon juice. Bake for 1 hour, or until the cake is golden brown and a toothpick inserted in the middle comes out clean. Cool on a rack for 10 minutes before running a knife around the cake and carefully removing the springform sides. Serve warm or at room temperature, with whipped cream if you like. Culinate editor's note: Depending on the size of your plums, you may need as few as four or five large plums to fill out the cake.